[BURMA 24.678] ’Building scaffolds at the Shwedagon Pagoda.’	Workmen are covering the central stupa of Yangon’s Shwedagon Pagoda in bamboo scaffolding so that the structure can be covered with a new layer of gold. Photo Mick Palarczyk. 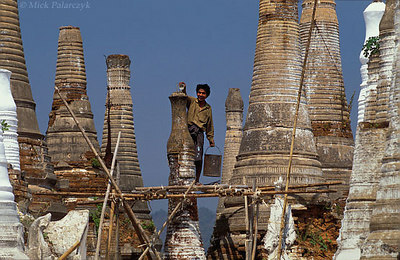 [BURMA 24.868] ’Restoring stupas.’	At Indein, a village on the west shore of the Inle Lake, restoration work has started at the dilapidated Shwe Inn Thein Pagoda complex (founded in the 11th century). Photo Mick Palarczyk. 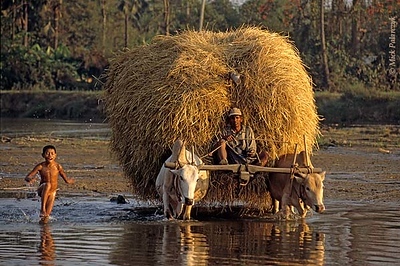 [BURMA 24.730] ’Hay-wagon and boy.’	Accompanied by a bathing boy an ox drawn hay-wagon is crossing a tributary of the Sittaung River at Taungoo. Photo Mick Palarczyk. 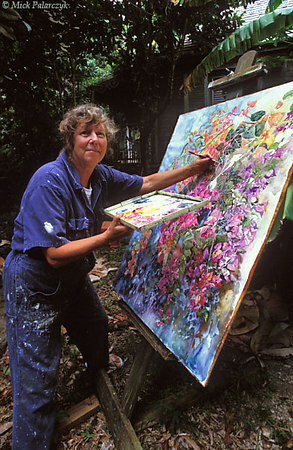 [ANTILLES.SABA 25.502] ’Heleen Cornet.’	Artist Heleen Cornet has been living on Saba since 1986. 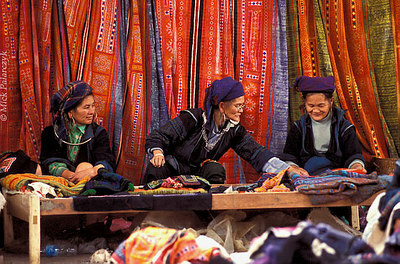 She draws her inspiration from the island’s landscapes, local people and vibrant colours. Photo Mick Palarczyk. 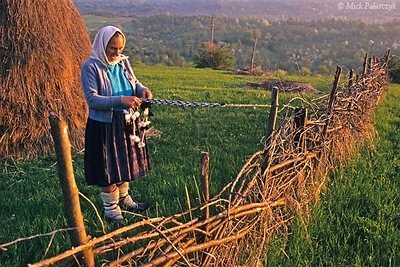 [ROMANIA.MARAMURES 23.655] ’Warm feet.’	Warmed by ‘opinchi’, shoes made after a medieval design, shepherd Ileana Petran is braiding a new belt for her shoulder bag. Photo Mick Palarczyk. 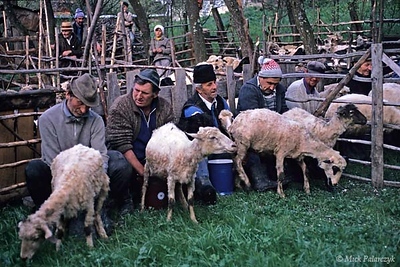 [ROMANIA.MARAMURES 23.829] ’Milking to the last drop.’	On a spring evening in Hoteni every farmer has to make sure all his sheep are thoroughly milked as a preparation for the ‘Stîna’ or ‘Measuring of the Milk’ festival next day. Photo Mick Palarczyk. 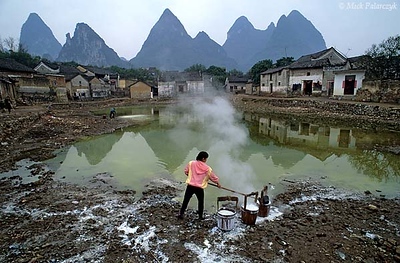 [CHINA.GUANGXI 25.405] ’Fish pond.’	In a village east of Yangshuo a woman is slaking lime and scooping it into a fish pond to lessen the acidity of the water. Photo Mick Palarczyk. 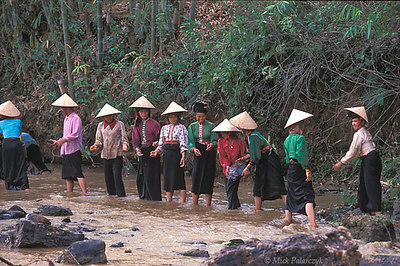 [VIETNAM.NORTH 21.297] ’Handing down boulders.’	Black Thái tribes women hand down river boulders which are used to build a dam for an irrigation wheel. (See image 21.293). Photo Mick Palarczyk. 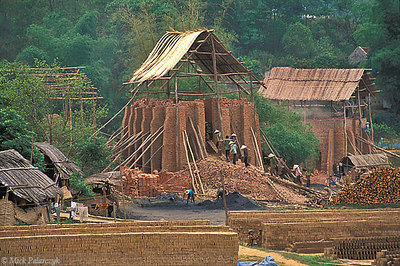 [VIETNAM.NORTH 21.259] ’Brick factory.’	Workers laden with unfired bricks climb rickety stairs to fill the bowels of this brick factory in the valley of the Dà River at Ky Son near Hòa Binh. Photo Mick Palarczyk. [TURKEY.CENTRAL 26914 'Sorting out potatoes.' Near the Cappadocian village of Güzelyurt a group of women is sorting out potatoes. Photo Mick Palarczyk. [YEMEN.SOUTH 26609 'Witches on a cart.' 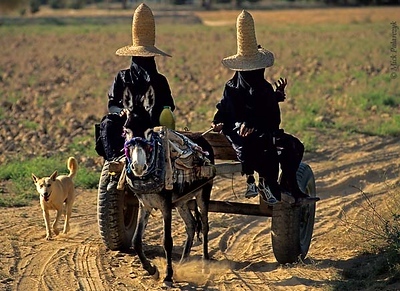 Near Al-Quatn women wearing tall straw witches' hats - known as madhalla - drive through the fields of the Wadi Hadhramawt on a donkey cart. Photo Mick Palarczyk. 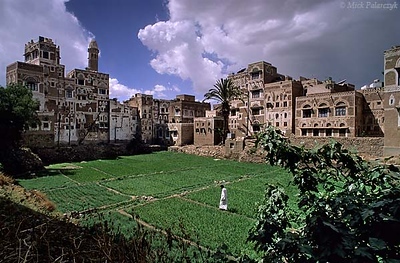 [YEMEN.NORTH 26425 'Garden in Harat At-Tawash quarter.' In Sana each city quarter (harat) has its own city garden (bustan). As the gardens are mostly situated in the vicinity of mosques, the radishes, onions and fruit trees in the bustan are irrigated with water from the same wells that supply the ritual washing basins of the mosques. Photo Mick Palarczyk. 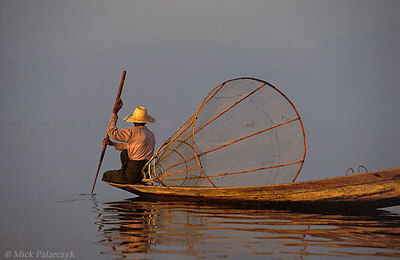 [BURMA 24.834] ’Searching for fish (2).’	While the first sun-rays are piercing the haze over the Inle Lake, an Intha fisherman searches the lake for a catch. Photo Mick Palarczyk. 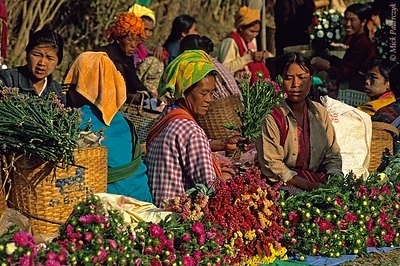 [BURMA 24.777] ’Market of Kalaw.’	Selling flowers on the market of Kalaw. Photo Mick Palarczyk. 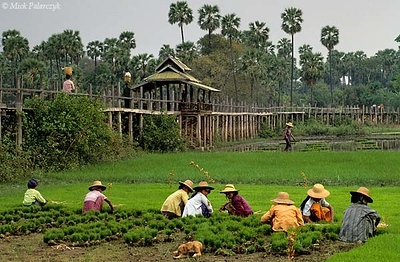 [BURMA 24.969] ’Stilted walkway at Ma Au village.’ In a field at Ma Au village on the west bank of the Chindwinn River, a group of women is collecting young rice plants that are about to be replanted in the watery field at the base of the stilted walkway. Photo Mick Palarczyk. 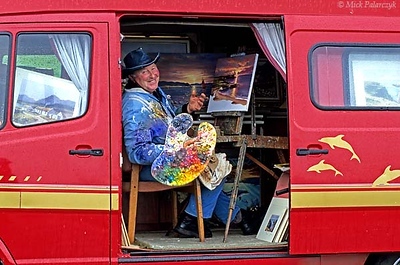 [BRITAIN.IRELANDNOR 21.857] ‘Rainy sunset.’	Sheltering in his van at White Park Bay near Ballintoy, the pooring rain doesn’t prevent this seascape painter from creating a colourful sunset on his canvas. Photo Mick Palarczyk. 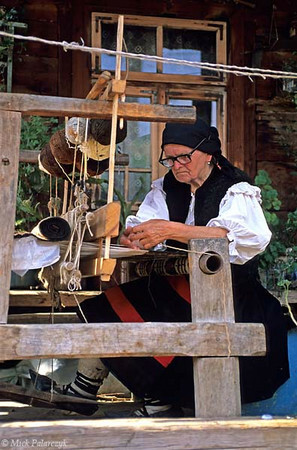 [ROMANIA.MARAMURES 23.747] ’Weaving on the verandah.’	Working on an old loom in front of her house this inhabitant of Botiza village uses wool that has been coloured by plant extracts. Photo Mick Palarczyk. 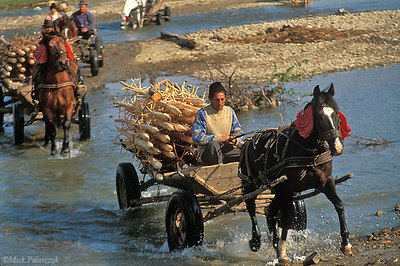 [ROMANIA.MOLDAVIA 24.023] ’Crossing the river.’	Returning from the market at Gura Humorlui and crossing a tributary of the Moldova these farmers transport stakes on which they will pile their freshly mown hay. Photo Mick Palarczyk. [CHINA.GUANGXI 25.417] ’Dredging for gold (1).’	At Chen Tang, 80 km north-west of Wuzhou, a barge is dredging the Meng Jiang River for gold. The larger stones are ending up as conspicuous pebble-bars in the riverbed. The smaller stones and grains of gold are trapped in ribbed boards. Photo Mick Palarczyk. 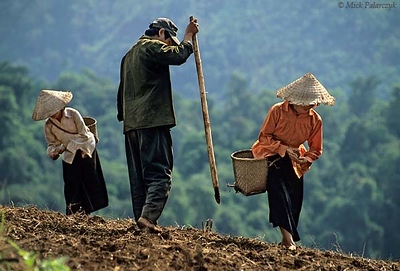 [VIETNAM.NORTH 21.362] ’Sowing maize.’	Sowing a field on the slopes of the Nâm Muc valley south of Lai Châu: the man pricks holes in the soil and the women drop maize seeds in them. Cultivation on steep slopes causes severe soil erosion in this region. Photo Mick Palarczyk. [TURKEY.CENTRAL 26786] 'Weaving a carpet.' In the Cappadocian village of Göreme a girl is weaving a carpet. Photo Mick Palarczyk. [TURKEY.CENTRAL 26940 'Phone call under the volcano.' 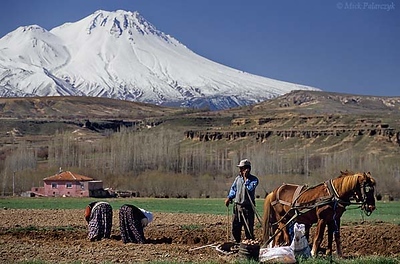 Near the Cappadocian village of Selime, southeast of Aksaray, a farmer takes a break from plowing his field, while two women are gathering potatoes that were hidden in the soil. In the background, covered by spring snow, loom the slopes the Hasan Dag volcano. Photo Mick Palarczyk. [YEMEN.NORTH 26488 'Farmer with plow.' In the mountains near Al-Mahwit, a town 65 km west of Sana, a farmer carries a plow to his fields. Photo Mick Palarczyk.